Trying to find the best breakfast sandwich in NYC is a dicey proposition because, deep down, when we’re honest with ourselves, sometimes we all just want that quick and easy sando from the bodega or deli on the corner. 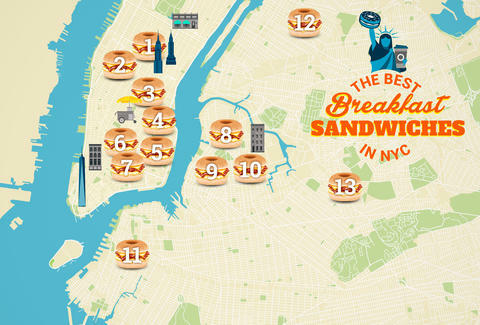 But if you find yourself in unfamiliar environs and in need of a quality bacon-egg-and-cheese, we’ve put together this map of NYC's best breakfast sandwiches so you can find the closest one. 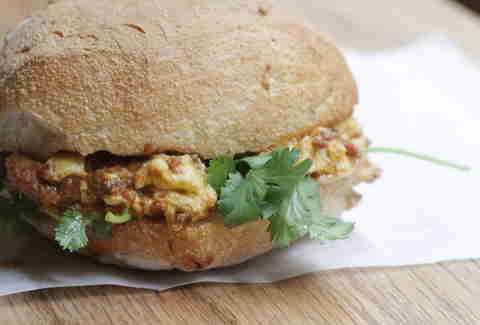 Soft scrambled eggs, beef chili, pimento cheese -- it’s kind of like the best breakfast Sloppy Joe imaginable. You could get creative with one of the cream cheeses of the week, but you don’t need to -- the bagels are huge and fluffy at this not-actually-in-Brooklyn mini-chain (locations in Astoria also), and the classic BEC is done proud with a not-skimpy amount of cheese and crisp bacon. If you put an egg on the herby roast pork Italian specialty it toooootally counts as breakfast. Just do it, you won’t regret it. They’ve got a ton of incredibly Instagrammable cream cheeses, but the sandwich move here is the Weezer, loaded with bacon, chorizo, egg, cheddar, and any cream cheese (we suggest bacon scallion). You don’t have to get all that meat, but if you’re a beast, you do. You know how you make fun of fancy BECs sometimes? 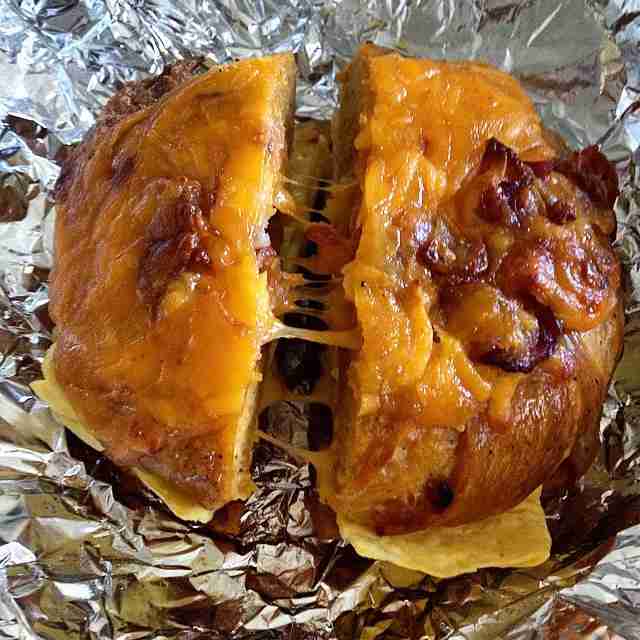 You won’t with the one at this buzzy Montreal bagel slinger. There are a lot of solid moves at this fancy all-day breakfast spot (the BEC with tomato and pickled jalapeño, the Soft Scrambled Pepper Boy, anything on a biscuit...), but the steak and egg is borderline cheating for a breakfast sandwich -- a French hero loaded with a sunny egg, grass-fed tenderloin, chimi-chili, and greens. You’re gonna want a donut, but if you’ve come to cure a hangover, the top-notch BEC comes heaped with tons of bacon, and you can always get a side of donut. The fluffy-yet-creamy soft scrambled eggs meld perfectly with the soft ricotta, and the whole thing gets lifted above just a plate of good eggs by the substantial herbed focaccia housing it. The standards are solid here, but you can also get all sorts of crazy, sporadically available bagel creations like a Cragel (part croissant/part bagel), a Candy Corn Bagel, and a Bacon Egg and Cheese Bagel that you should definitely order filled with bacon, egg and cheese. Def. Initely. This Court St Italian place brings it on its brunch menu with a pork belly joint topped with a fried egg, vinegar pepper, Sriracha, and yogurt. Is an open faced sandwich even a sandwich? That’s a question for a different article, this one is about how awesome an open-faced fried egg, béchamel, cheddar, and chopped smoked bacon on a massive English muffin is. 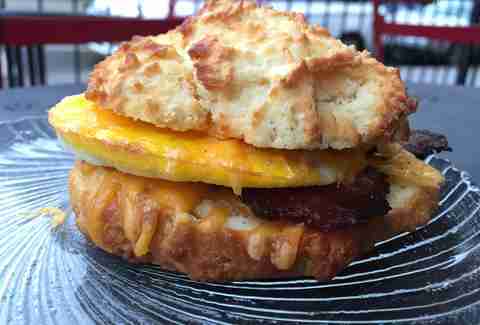 The move at this neighborhood cafe is to grab a New Yorker (egg and cheese) with spicy bacon on one of its excellent homemade biscuits and grab a seat al fresco on the sidewalk. 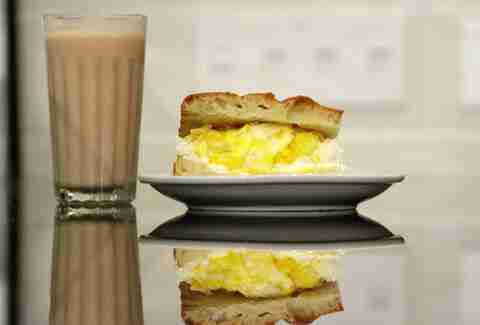 Andrew Zimmer is Thrillist’s NYC Editor and can’t start his day without a bacon, egg, and cheese. Follow him on Twitter and Instagram.